I feel summer around the bend. Day's are heating up and I have some stash fabrics I'd like to use. I got this quilting cotton in Nova Scotia at a fabric store that was going out of business. It was something like a dollar a yard and I had just decided I need to wear more color. So I took the rest of the bolt. 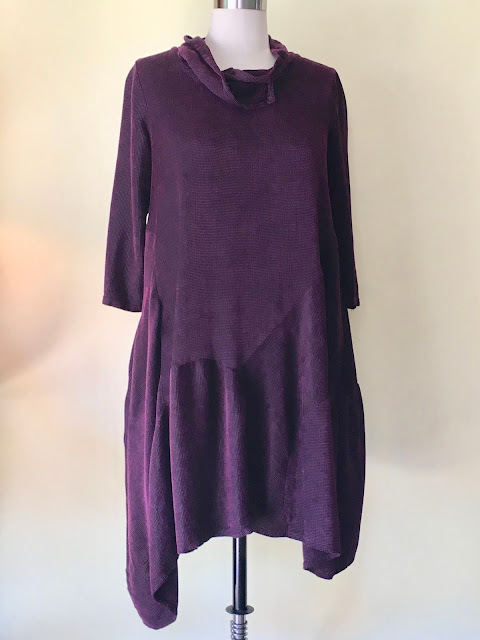 I've made Marcy Tilton's V9174 before and enjoy wearing it but I wanted to add pockets. I've been taking a once-a-week sewing workshop with Kiki Barrett, a local fashion design, sewist who is, in my opinion, on the highest branch of the tallest tree. She's talented, patient, easygoing and innovative. Her 5 hour workshops on Fridays are not to be missed. Check out Cabrillo College Extension for the next session if you are anywhere near the Santa Cruz, CA area. Anyway...Kiki helped me figure out how to add pockets to this design. She suggested adding a second layer to the bottom-most pieces. It worked great. It did add some heft to the garment so it's more of a spring/fall piece than summer but I'm happy with it. Here's a detail of one pocket. The other side is slightly different since they both fit into existing asymmetrical seams. I'm a huge fan of Martin Margiela of Maison Margiela. I was in Barney's SF last fall and spotted a leather purse he calls the Origami Bag. I fell hard. But, I don't wear leather purses often. I thought about it, went online and dreamed about it...but that kind of purse is not suitable for my lifestyle, it's just too classy. But the lines were fascinating. It's basically a square that is folded origami style. I decided to try it using an old pair of denim pants, zippers, handles, hardware and scrap leather I had in my stash. I had so much fun making this. I don't think I'll make another, I think I got it out of my system. But it was a fun exercise to look at a design and then try to copy it. My hat is off to Mr. Margiela and his designers, they are geniuses! The handle can be attached in the place you see it above, or can be attached at either side where you see one of two loops. Or you can attach it to the bottom. Ingenious. Take care and have a wonderful late spring. I'm not even sure tetrad is the correct term to use here but I was looking in Thesaurus for a word beginning with "t" that meant four. This is what I came up with so there it is. Anyway...I'm back on the Tilton sister's train with four new garments, all from TNT patterns I love to make and wear. I've made Marcy's V9230 three times now, as a coat and a vest. It is generously sized so it fits comfortably over other clothing. This version is made using what I think is home-dec fabric given to me by my dear friend, Lynn. Thank you Lynn, I loved working with this fabric. It doesn't show in the pics but it is several shades of earthy green. You should give this pattern a whirl, it is not a quick sew but really satisfying. It has something like 21 pattern pieces, most single cut, so it's not for everyone. But it falls right in line with my new slow sewing practice. And when it's done there is such a sense of accomplishment. Here is a wad of luscious, velvety purple corduroy-like fabric that was given to me by another great friend, Patty. She cut it out for a long dress but decided against making it. I found it on the free table at a retreat this spring and swooped it up. 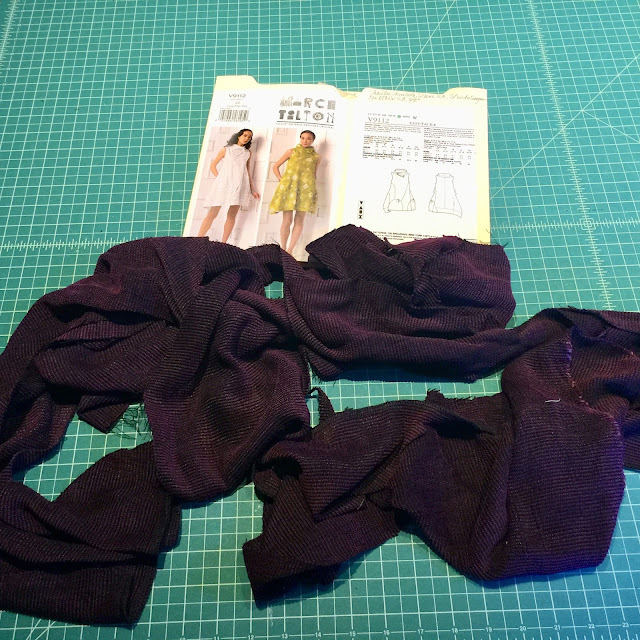 I wanted to try inserting sleeves in Marcy's V9112. The sleeves I cut work well. This is just a muslin since I think this fabric is a bit heavy for the pattern. But it will be a great knock-around dress. The fabric is very soft and comfy. For the next go-round (in thin black linen, I think) I want a tunic length. I'll try making all of the pieces shorter by cutting along the bottom of all the pieces at a smaller pattern size line. Hoping that will work. I had so little fabric I didn't even have enough for the neck facing so I used a scrap of Kaffe Fassett cotton. The last time I went to the Sewing Expo in Puyallup I met Marcia Derse. She designs primarily quilting fabrics but the quality of the fabrics she uses and her designs are also great for garments. This fabric is called Treasure Hunt. Once again I didn't have a lot of fabric so I had to cut creatively. I used another TNT pattern, Marcy's V9171. This is a not-to-be-missed pattern. It looks good on every single person who tries it on. And it's very fun to make. I like to wear it with a Diane Ericson Fault Lines vest. This is the first time I've made Katherine Tilton B6491. The fabric is a slightly stretchy black denim I got from Marcy. It turned out to be a bit too heavy for this pattern to be considered a shirt. But I'll wear it as a coat dress in cooler weather. I'd make this again in a minute using a lighter weight fabric. I faced the pockets with collaged fabrics I made in a Holly Badgley class. I'm loving the deep dive into my stash these days, it feels really good to use what I have. And here's the other pocket. I bought some killer rubber snaps at Passamaneria Toscana while in Florence. Wish I'd bought many more. Do any of you know where I can find them online? I've seen this snap closure treatment on several RTW garments. This technique is NOT an easy thing to do well. Mine are passable, not perfect. And that's it for the Tilton Tetrad. I have the whole weekend off and I'm headed to the bunkhouse to sew!